"Life is Magnificent! 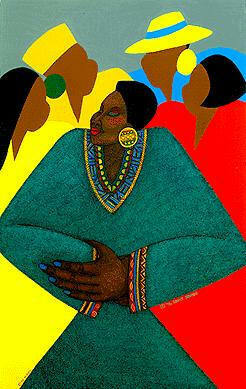 Accept, Release, Relax and EnJOY IT..."
My art is a very special spiritual gift that I humbly accept and deeply respect. I could have never imagined all the joy that I have been able to share with people all over the world because of this blessing. But one of my greatest pleasures has been creating signature images for non-profit organizations enabling them to raise funds for their worthy causes. Sisters In Business is ALL about empowering women and girls, and that IS so much what I'm about. 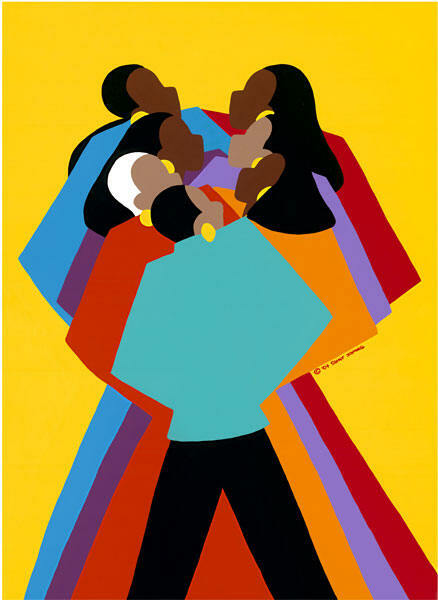 Originally "Empowerment" was conceived as the possible signature image for Girls Inc., Los Angeles, but actually became the signature image for MOSTE, Motivating Our Students Through Education, a mentoring program for African American and Latina middle school girls. How kismet is it that Tekelia "Googled" [Internet Search Engine] and found me and my art, searching the word "empowerment". Sisters in Business is proud to present Ms. Synthia SAINT JAMES, a LIFETIME MEMBER in the Sisters In Business Network. 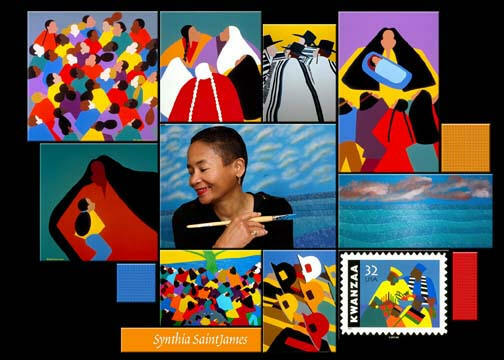 Self-taught Artist/Author, Synthia SAINT JAMES was born in 1949 in Los Angeles, California. Her professional career as an artist began in 1969 in New York City where she sold her first commissioned paintings. Today she is an internationally recognized fine artist. 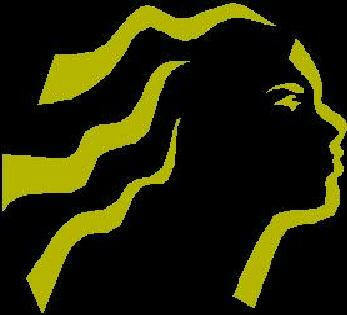 You'll find her work on over 60 book covers (including books by Alice Walker, Terry Mc Millan, Iyanla Vanzant and Julia Boyd), and on several licensed products. 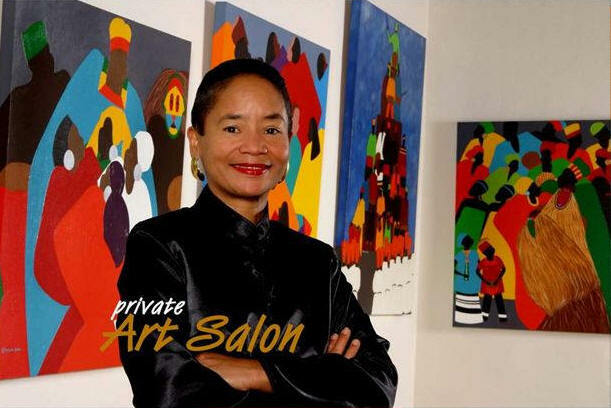 Since 1990, she has completed over 50 commissions for major organizations, corporations and individual collectors, including The House of Seagram, Brigitte Matteuzzi's School of Modern Jazz Ballet (Geneva, Switzerland), the Mark Taper Forum, The Los Angeles Women's Foundation, Kayser-Roth/Maybelline, Essence Magazine's 25th Anniversary, The American Library Association, UNICEF, Dance Africa, The Girl Scouts of the USA's 85th Anniversary, Attorney Johnnie L. Cochran, Jr., and The United States Postal Service, who commissioned her to create the first Kwanzaa Stamp, made available on October 22, 1997 with the first issue day ceremony at the Natural History Museum in Los Angeles. The Kwanzaa Stamp has been reissued as a 37 cents stamp. She has also completed commissions for Coca Cola for "The Lady of Soul Awards", for the American Dance Legacy Institute in honor of Donald Mc Kayle's Ballet "Rainbow 'Round My Shoulder", the Natural History Museum of Los Angeles, in honor of the late Congressman Julian Dixon, Children's Institute International, Crystal Stairs, Maryland's Human Resource Department, the International Association of Black Professional Fire Fighters, in tribute to the 12 Black Fire lost in the terrorist attacks on the World Trade Center, and for many other non-profit organizations. She has 13 Children's picture books currently on the market, three of which she wrote, "The Gifts of Kwanzaa" and "Sunday" (A Parents Choice Silver Honor Book) published by Albert Whitman (&) Company and "It's Kwanzaa Time" (a lift the flap book) published by Simon & Schuster. 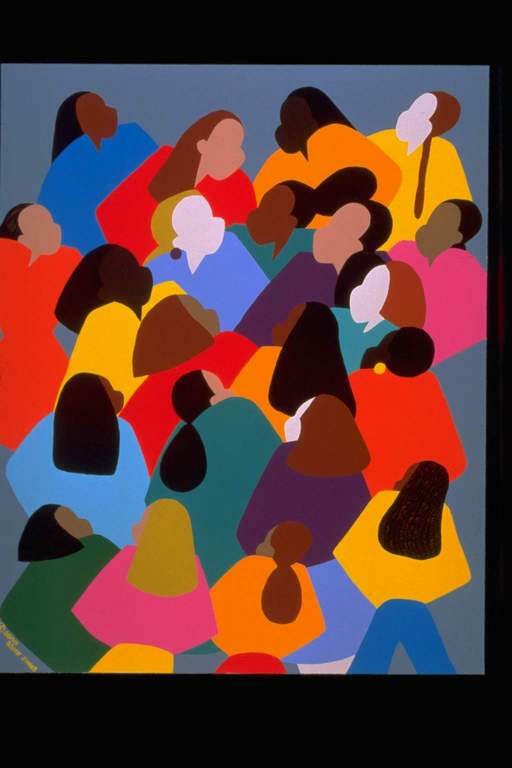 She received a 1997 Coretta Scott King Honor for her illustrations in "Neeny Coming, Neeny Going" published by Bridgewater Book and 4 activity books co-authored with Bunny Hull, published by Dream A World. She also has 2 books of poetry and prose, "Girlfriends" published by Peter Pauper Press and "Can I Touch You: Love Poems and Affirmations" an audio book, and a multi-cultural cookbook "Creative Fixings from the Kitchen" published by Persnickety Press. She has received numerous awards for her outstanding contributions to children's books and other humanitarian activities. Click here for more information about Synthia SAINT JAMES. ""Life is Magnificent! Accept, Release, Relax and EnJOY IT..."